One of my favorite poetry blogs is Tricia Stohr-Hunt’s The Miss Rumphius Effect. Tricia is an assistant professor of Elementary Education at the University of Richmond, as well as a blogger, poet, and all-around wonderful person. Each April, Tricia chooses a poetry theme, then writes daily posts based on her theme. These posts are incredibly thorough, informative, and inspiring. Yesterday’s post on ekphrastic poetry was no exception. I had already been thinking about writing some ekphrastic poetry this month because of Irene Latham’s amazing National Poetry Month project, ARTSPEAK! 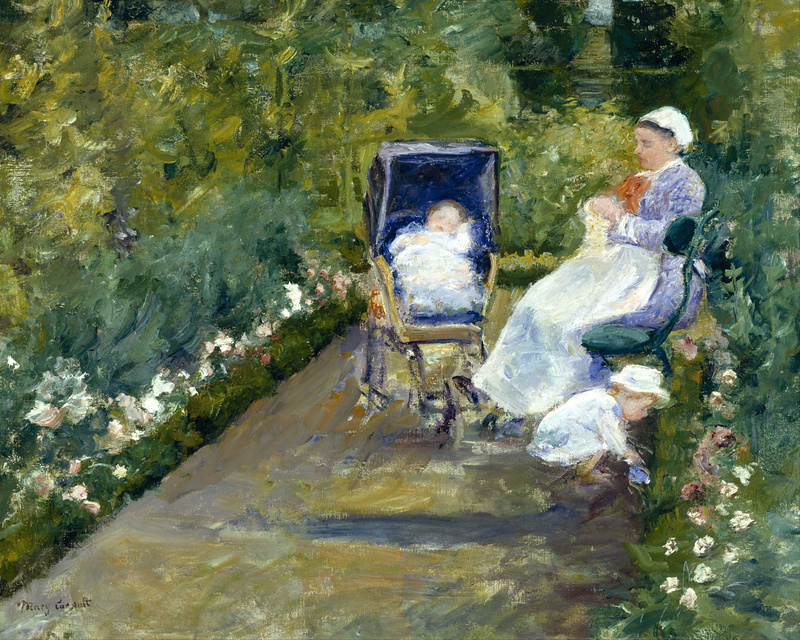 and this painting, Mary Cassatt’s “Children in the Garden (The Nurse)” April’s image on the calendar hanging in my kitchen. The more I studied these people, the more they seemed like the perfect subjects to give voice to. As I began jotting ideas about what each person in the painting might be thinking, or dreaming about, it became clear that there would be echoes between the three. Again inspired by Tricia and her compatriots, The Poetry Seven, I decided to try a villanelle. This form has a specific rhyme scheme and pattern of repetition. I’m not in love with the word “done” to describe when lunch is over, but it had more rhyme options than other choices, so I kept it for this draft. as she dozes in the warm summer sun. on a June afternoon, when lunch is done. I play in the garden, watched by no one. of water, glistening, into the warm summer sun. this June afternoon, when lunch is done. Spying a cricket, I give chase. I won! as bright as the warm summer sun. Breezes stir; I’ve had my fun. and doze in the warmth of the summer sun. Thank you to Stacey, Tara, Dana, Betsy, Anna, and Beth for this space for teachers and others to share their stories each Tuesday. 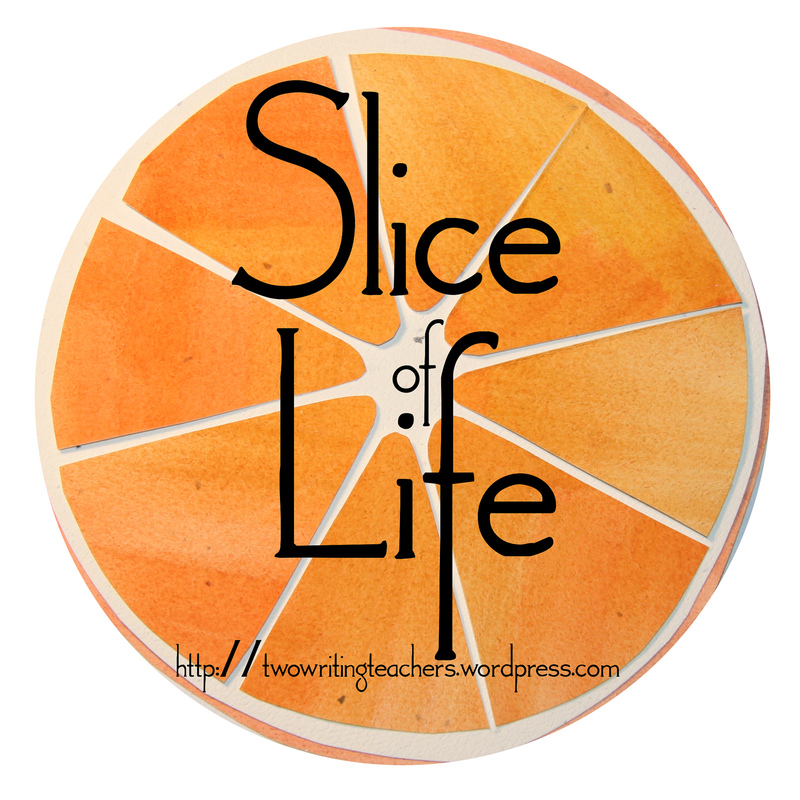 Be sure to visit Two Writing Teachers to read more Slice of Life posts. Catherine, you are too kind! I write these April posts as much for me as anyone else. It’s my excuse to dive in deeply to poetry at a time of the year when I often need the distraction most and can’t really afford it! I will say that I am having fun this time around. Villanelles are tough, aren’t they? I think you set this up beautifully. And you’ve done a fine job connecting the form to the painting and the action. Well done! Wow! I love this. I love the idea and I love the story you revealed and your lovely choice of words that helped me “see” this story as it unfolded. Lovely. Really lovely. I love Mary Cassatt! I think this kind of poetry is hard to write! The glimpse into your writerly thinking of the word, done, gave me a different way to read this the first time. Fun to put the words to the people in the painting. Sweet scene! Sweet words. So lovely, Catherine – and such a hard poetic form to tussle with! Bravo! I am bowing down to you and tipping my hat (if I had one). That is one tough style of poetry! Your words were a perfect complement to the painting. (I am a huge Impressionist fan.) What fun to read! Ekphrasis is one of my favorite types of poems to write and villanelles my least favorite. I’ve written only one ever. The repetition and rhyme draw me in to the warmth and childlike joy of the painting. This slice is perfect. I love how you’ve taken this painting and given it voice. No apologies necessary for the use of done. It works and (I think) is quite an appropriate word in child think. Adding poetry to art is a perfect companion. Your poem is just perfect and I would also like to thank you for the resources! I have just started tinkering with poetry, but I have so much to learn. Thank you for the loveliness. Mary Cassatt is a favorite. Your poem was delicious. Simply delicious. I am completely there. It’s a fabulous writing to the painting. I’ve enjoyed Tricia’s posts, too, & Irene’s poems with the paintings. I love that last quatrain, Catherine. It’s just lovely.